If you are here from Amy's Creative Side, welcome! I have been pondering which quilt to showcase for Blogger's Quilt Festival. If you have been following along for the last couple of months, you have seen many pictures of Colorbox, from inception to completion. So I decided instead to show this quilt. 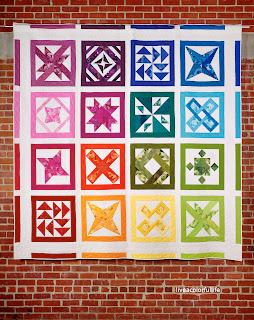 I first saw it in an issue of American Patchwork and Quilting and fell in love with it. I ordered the fabric (all American Jane--love anything by American Jane!--a kit is still available) and started working on it. It was originally intended to go to friends who were having a baby. But after I started working on the blocks, which are really large, with a crazy amount of half square triangles, I decided to make an easier quilt for the baby (all American Jane scraps), and give Double Dutch to someone else. When our best friends' daughter got married two years ago, this quilt went to live with the newlyweds. Thanks for stopping by. Enjoy the rest of the Festival! Oooh Cindy! This one is beauty! Hope you're having fun at market!! Wow how beautiful! My first attempt at half square triangles was not much of a success, I ended up cutting off most of the triangle points. Oh well, guess it's an excuse to practice more. Thanks for sharing! Oh that's a pretty one - HSTs are probably my true love! How funny - how many quilts are you showing today! I love the quilt you chose to feature. I love how big the blocks look, especially with such little pieces to sew together. It looks great, I bet they love it! Oh, my!!! This quilt is GORGEOUS!!!! So many HSTs, wow!!! What a beauty!!!! I have the wanties! This is gorgeous!! Thanks for sharing. Very pretty Cindy! What a lovely gift. Are you enjoying quilt market enough for all of us? I hope so! Really pretty, Cindy. The things you do with colour...! 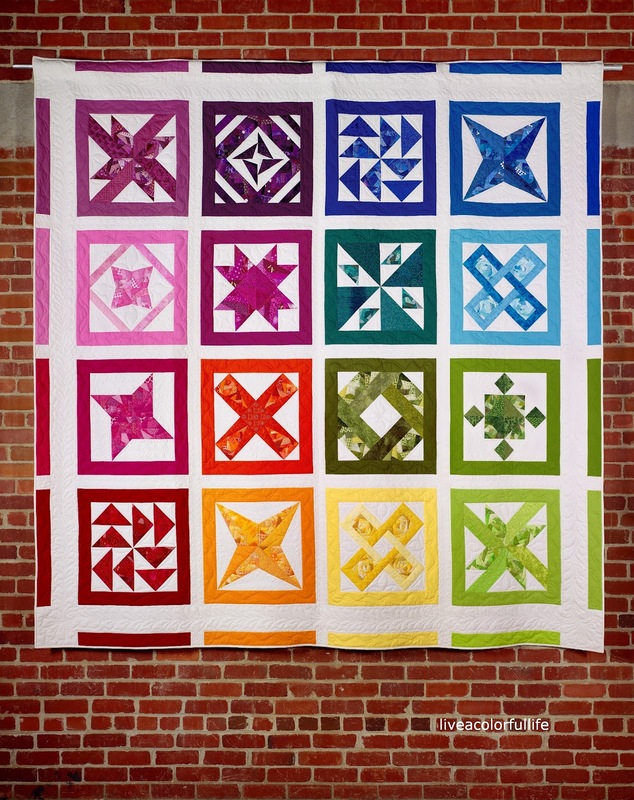 Wow, not sure which rainbow quilts I like better. Both are wonderful@! I just love your Double Dutch quilt. It is such a classically beautiful quilt. Beautiful quilt, Cindy! See, you DO finish things!! It's gorgeous! I am sure the happy couple treasure it. The baby quilt is pretty cute too! I love this quilt Cindy!!!! Your double dutch quilt is new to me. What a special gift! Thanks for sharing. I staggered to the computer this afternoon, after washing camping stuff and feeling generally like I was walking through the middle of a marshmallow all day, and went OH WOW! Blogger Festival! So, because of you, I quickly wrote up a post before the deadline and got it done. Thank heavens for you! I love this quilt I have made a lot of American Jane quilts but have yet to make this design I may just be inspired now thanks to you! I remember seeing this quilt in the magazine and thinking how much I loved it. It is beautiful. I don't know how you were able to let it go.